The 2015 Assembly election in Bihar is like none other in the state's history. Never before have political parties in the Bihar invested so heavily in their publicity campaign. Chief Minister Nitish Kumar has hired the services of Prashant Kishore, who was a key strategist in Narendra Modi's Lok Sabha election campaign. This was followed by a slew of innovative campaign slogans from the Nitish camp such as 'ghar-ghar dastak', 'chaupal mein charcha' and 'badh chala Bihar'. Of course, the BJP could hardly be expected to be left behind their erstwhile ally Nitish Kumar and their former strategist Prashant Kishore. 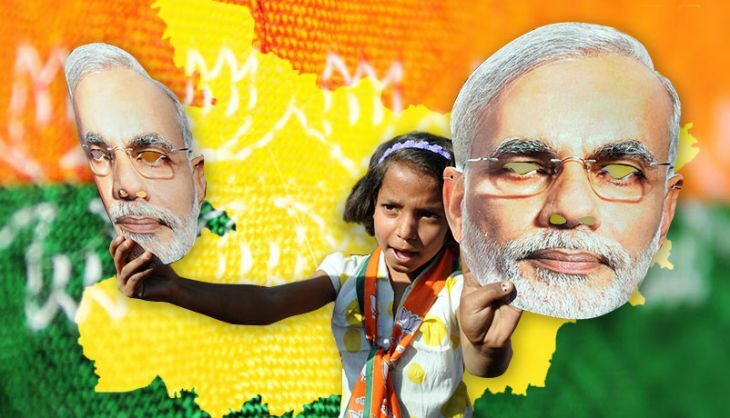 The BJP-led NDA has evolved an aggressive campaign strategy and their core message is 'change'. BJP hopes that the fatigue caused by 10 years of Nitish rule will catapult it to power. But there are two visible problems in using 'change' as a core political message. First, the very idea of anti-incumbency has been put to question. Several chief ministers such as Shivraj Singh Chouhan, Narendra Modi, Sheila Dikshit and Nitish himself have enjoyed consecutive victories in their respective states. Second, there are limits to how much BJP can foster resentment against 10 years of Nitish's rule, given that it was part of the ruling alliance for 8 of those years. Given the limitations of targetting Nitish's tenure, the BJP is focussing on his alliance partner Lalu Prasad. An important pillar of BJP's campaign strategy is to remind people of Lalu's Jungle Raj - the chaos and backwardness that allegedly characterised Bihar during his and Rabri Devi's rule. However, bringing up the past also has its drawbacks. It may bring back memories of Bihar's caste polarisation and the politics of social justice may get re-awakened in the minds of the people. This could lead to consolidation of Dalits and Muslims. To combat this, BJP president Amit Shah has prepared a 'counter mobilisation' strategy. Main aim of BJP's publicity blitz is to break Nitish's clean image. Could this backfire like it did in Delhi? In keeping with its hi-tech ways, the BJP has devised a plan to reach out to Bihar's remote villages using 160 GPS-enabled pick-up vans that have been modified to resemble chariots. Every chariot, aptly named Parivartan Rath, has a 56 inch screen that shows documentaries on the failures of the Nitish government. They also show video clippings of the earlier political spats between Lalu and Nitish. The idea behind these exhibitions is to create fears that the Nitish-Lalu alliance will fail. Important political leaders from the Centre and Bihar are also expected to participate in these processions and hold impromptu rallies in different parts of Bihar. But it isn't just the chariots, the BJP is reaching out to the people using various methods ranging from mobile ringtones, SMS messages, WhatsApp messages, Facebook and Twitter. In every rally, the party sets up stalls selling Modi badges, Modi kurtas, Modi stickers, and Modi gamchaas (towels) for men and Modi shawls, Modi stoles, Modi's purses for women. Cloth weavers from Surat in Modi's home state Gujarat, have been roped in to design special Modi bags. The imagery is quite telling. The bags have Modi's picture along with a saffron map of Bihar with a lotus inside it. On each bag is written the BJP's slogan 'Sabka Saath Sabka Vikas'. The fundamental aim of this campaign is to ignite anti-government feelings among the people and break Nitish Kumar's 'clean' image, which is the main strength of the grand alliance. The chariots will traverse the length and breadth of Bihar, covering all the 243 constituencies. They will try to establish a direct connection with the voters and spread the NDA's message of change. The BJP's aim is ambitious: 1 lakh rallies in 100 days. The party will hold massive rallies of the prime minister in key locations. At his recent rallies in the state, Modi set the tone for the elections by launching scathing attacks on Nitish. However, the BJP needs to be mindful that personal attacks can backfire. The BJP and Modi were extremely aggressive in attacking Arvind Kejriwal during the Delhi elections, which backfired badly on the party. Compared to the BJP's hi-tech campaign, the grand alliance is using popular mediums to reach out to the people. It wouldn't be surprising to see BJP's 'parivartan rath' screening documentaries against Nitish a few blocks away from a street corner where the CM's virtues are being extolled in a Nukkad Natak. The fierce competition is forcing both the alliances to innovate continuously and come up with new techniques during the course of the campaign. There is an intense pressure to react quickly to an attack by the rival. Soon after Modi criticised Nitish during his rally in Muzaffarpur, the Grand Alliance put up posters with a catchy slogan 'Jhanse mein na aayenge, Nitish ko jitayenge' (we will not be duped, we will make Nitish win). It now remains to be seen who captures Bihar's imagination and how far such methods will deepen Indian democracy.